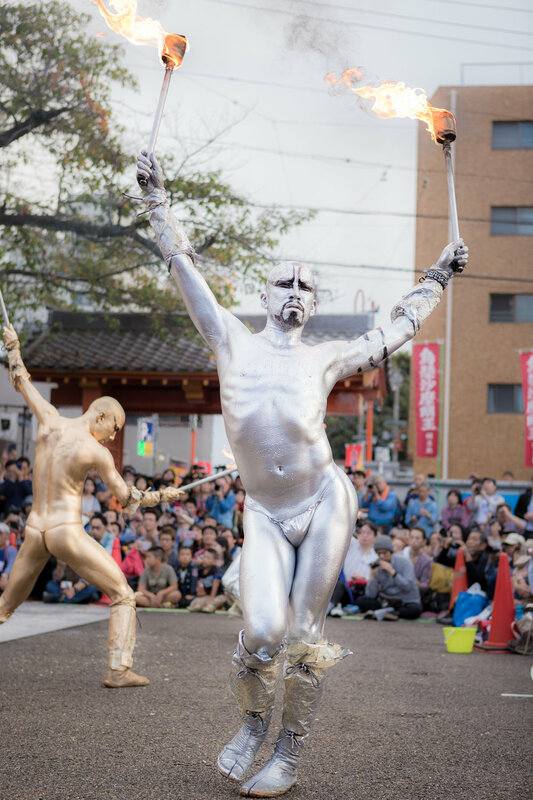 The street performer's festival (大須大町人祭), held in Osu Kannon every year in October, is always my favorite festival in Nagoya. 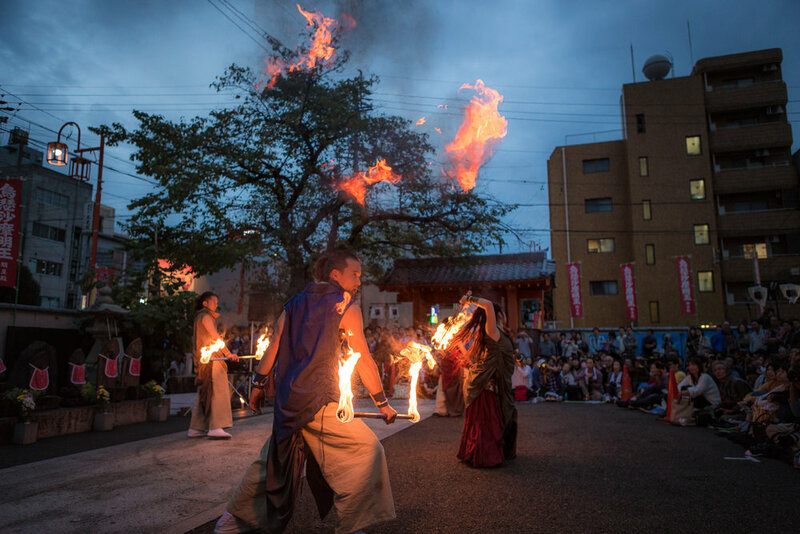 It runs all day Saturday and Sunday with performances going on simultaneously all over the Osu Kannon area. It's a bit daunting, fighting with all the other photographers and gawkers for prime photo taking real estate, but the acts are bizarre and beautiful and captivating, and worth the fuss. My first time attending the festival several years ago, I didn't know what I was doing and ended up watching all the acts from behind a lot of heads, or searching for less popular acts, but this year I got the schedule in advance, figured out which acts I wanted to see, and made sure to get to the popular acts early enough to get a decent spot. I brought two cameras, one with my wide zoom, and one with my long lens, so that I'd be prepared to catch the action, whether close-up or from a distance. 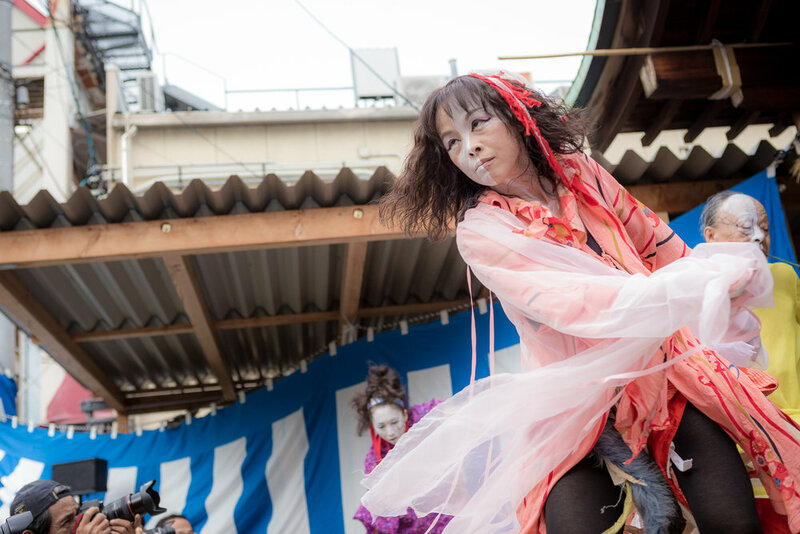 The festival starts with the opening ceremony and the Oiran Procession (おいらん道中). 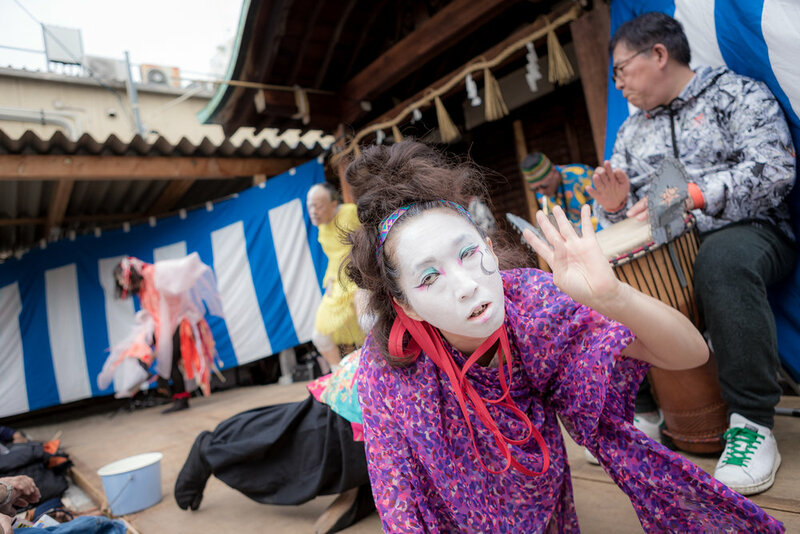 This is a first chance to see all the performers, and the Oiran Procession is a traditional Osu Kannon activity where "courtesans" walk around the area in a formal procession. The first act I watched was the Happy Merry Circus (ハッピーメリーサーカス). 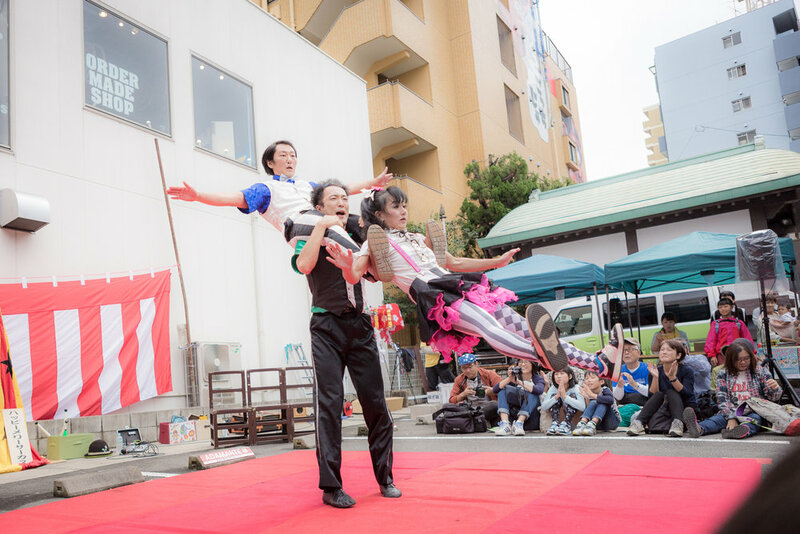 It was a three member team who did juggling and pantomime. The highlight was when one of the performers ends up inside a giant yellow balloon. Next up was Meriko (めりこ), who performed in the same location. She is a crowd favorite, so there was a rush to get good positions after the Happy Merry Circus finished, but as I was already near the front, so I didn't have to fight too much. Meriko is a classically trained dancer who gained experience while living in New York. She says she is the first official street pole dance artist in Japan. 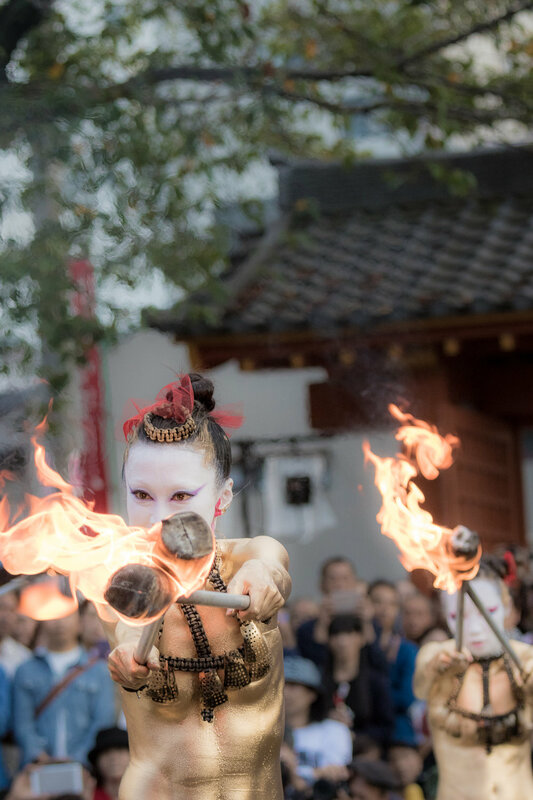 Her performance tells a story of loss and rebirth, where eating fire represents the death of innocence. 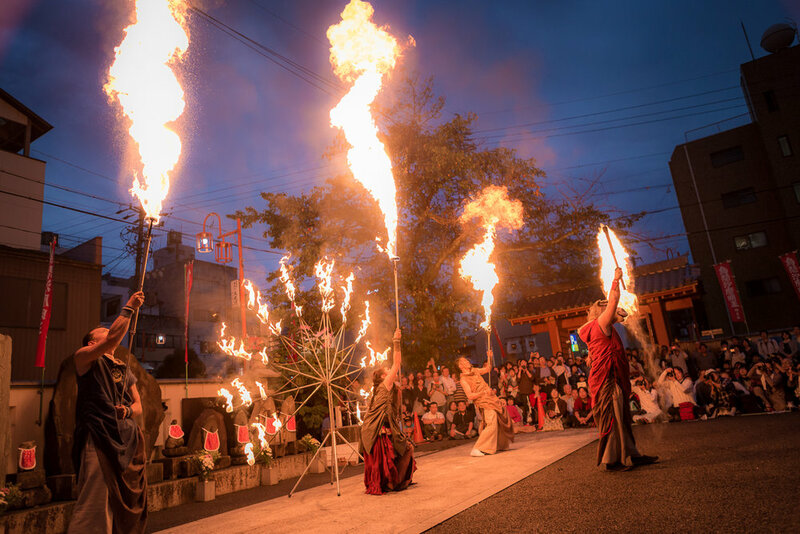 It is set to very dramatic Japanese theatrical music. Upon her rebirth, after eating the fire, she wants to set the world on fire. As the world burns, she climbs onto her pole. It is a very high energy performance, and she is obviously in tremendous shape. It's obvious why she is so popular. 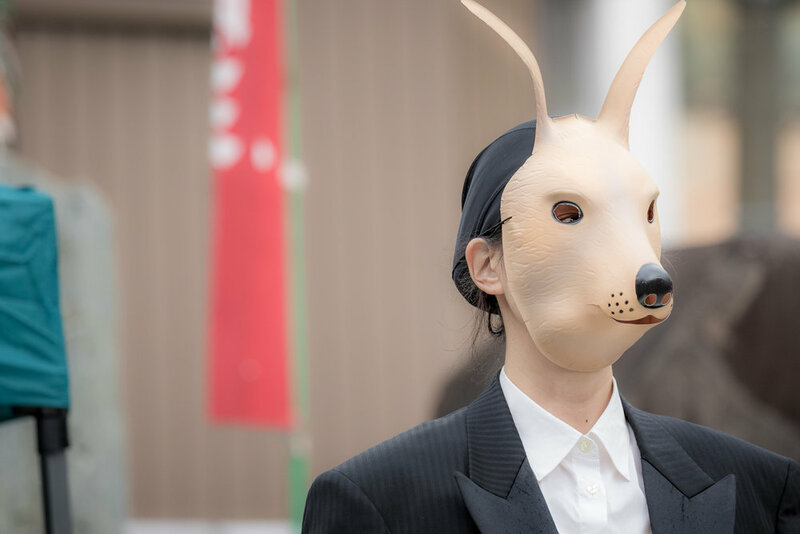 Another act I try to catch every year is Decalco Marie (デカルコ・マリイ). 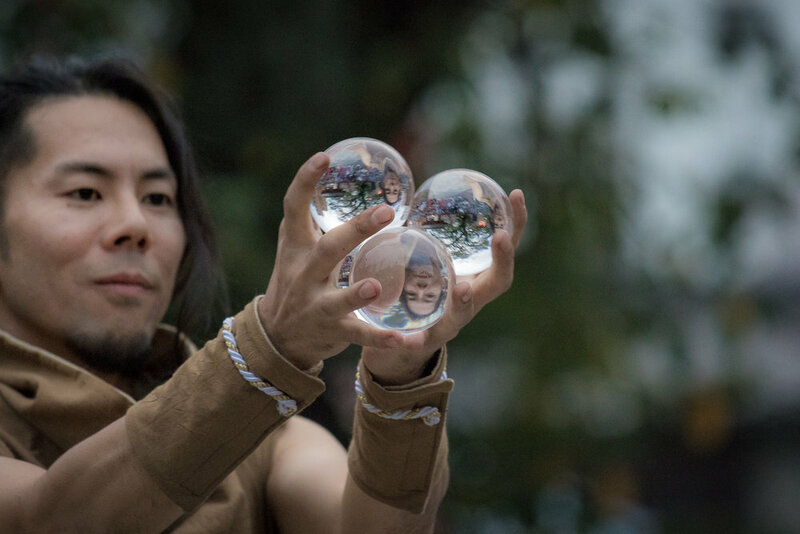 His act is pretty hard to describe, but the photos give you some idea. What you don't get from the photos is the music from the band, which is a sort of free form avant-garde jazz combo. Decalco cavorts around with his two female partners, acting out a story whose plot I could only guess at. 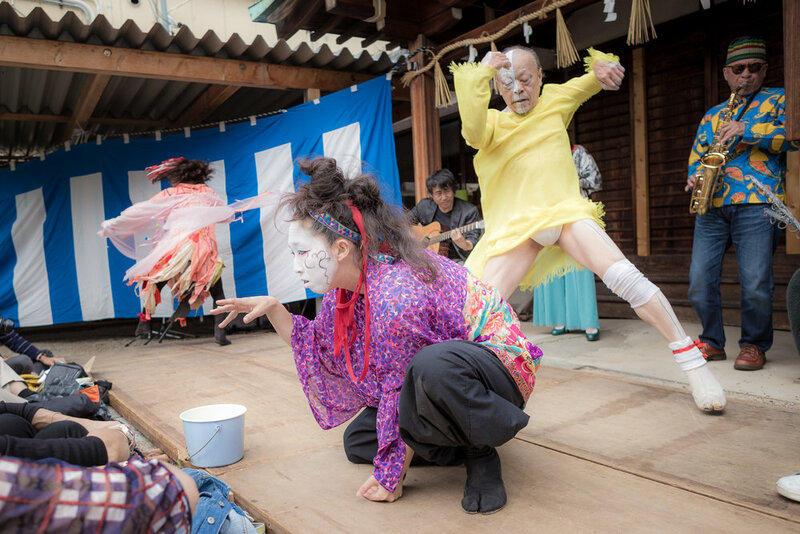 One thing I like about this festival is the close proximity you have to the performers, who often move among the audience during their performances. I was glad to have my wide angle lens, or I would not have been able to take in the scene from such a close vantage point. I moved to a different venue for the next performance. 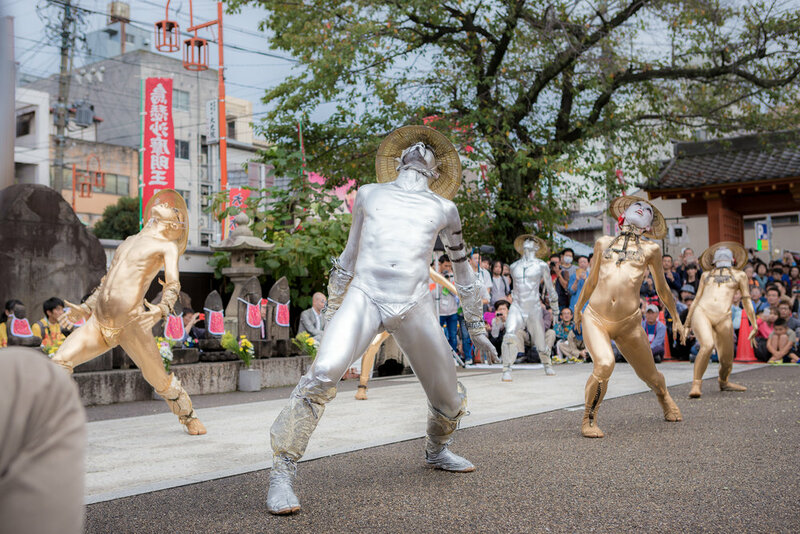 I wanted to see the Gold Dancers at the Daikouin temple area, but being they are probably the most popular act at the festival, I was afraid that the enclosed temple area would get too full to enter, so I went to catch the act before them in order to secure a spot which afforded an unobstructed view. 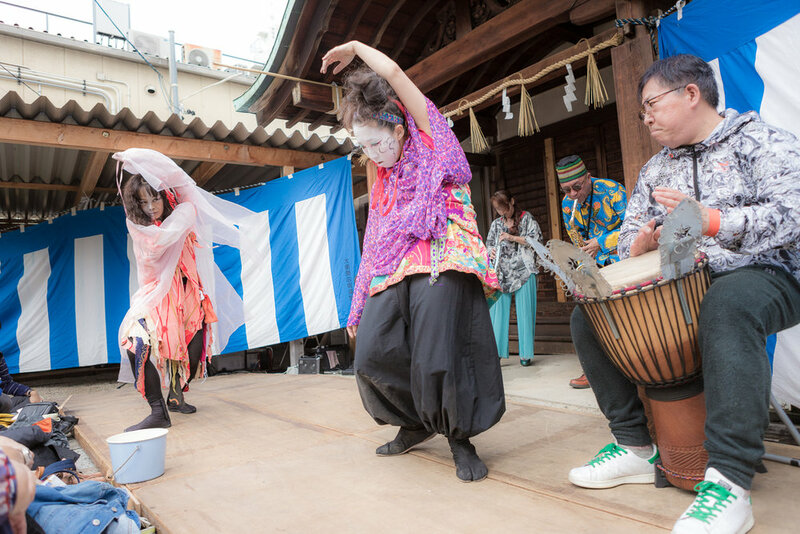 The act that came before them was Hara Project (ハラプロジェクト), which I later learned is a performing arts group that creates original performances. As with Decalco, this act was hard to describe, but involved people eating cabbages, surrounded by mouse like creatures, a "reporter" and her "cameraman", and dancers. It was bizarre, but very entertaining. For this act, too, I used a combination of wide and close-up shots. 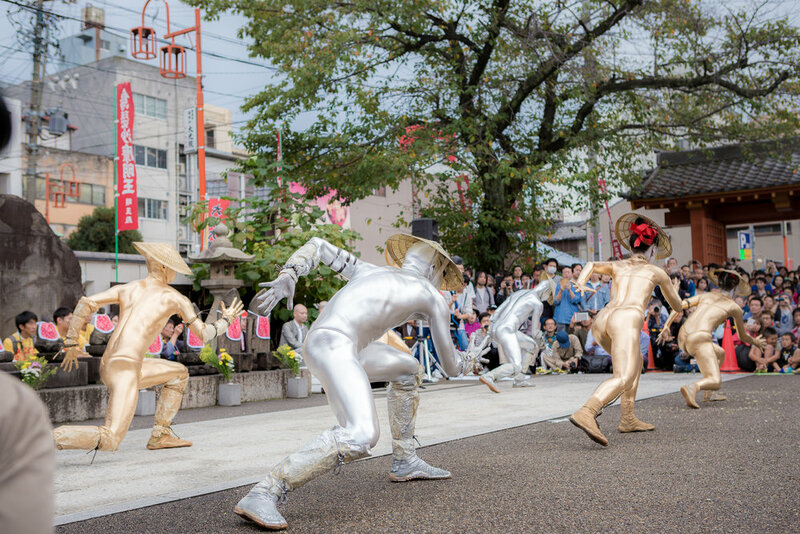 Then, it was time for the Gold Dancers Show (金粉ショー). I heard that some of their fans had been waiting at the location since early morning in order to stake out the prime positions. Many of them had come equipped with video cameras, tripods, and small chairs to sit on. My position was not ideal, but I squeezed in as best I could. I started with some wide, establishing shots. Then I switched to my 200mm to get more detailed shots. The makeup they put on their bodies was amazing stuff, and fascinating to see close-up. Then, they lit their torches. I wished it had been a bit later in the day so that the fire would show up more dramatically, but by framing the fire against dark backgrounds (people sitting across the way etc.) I was still able to catch some detail in the fire. 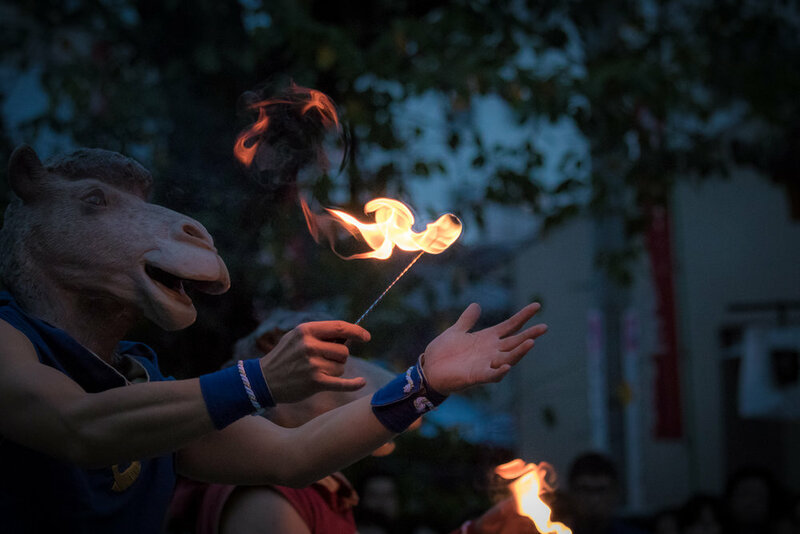 The act that followed the Gold Dancers was the Fire Bandits (火付き盗賊). I checked the sunset times and decided to catch their early evening act, so that darkness would be falling during their performance, lending drama to the fire play, and also allowing me to fiddle with slower shutter speeds a bit. 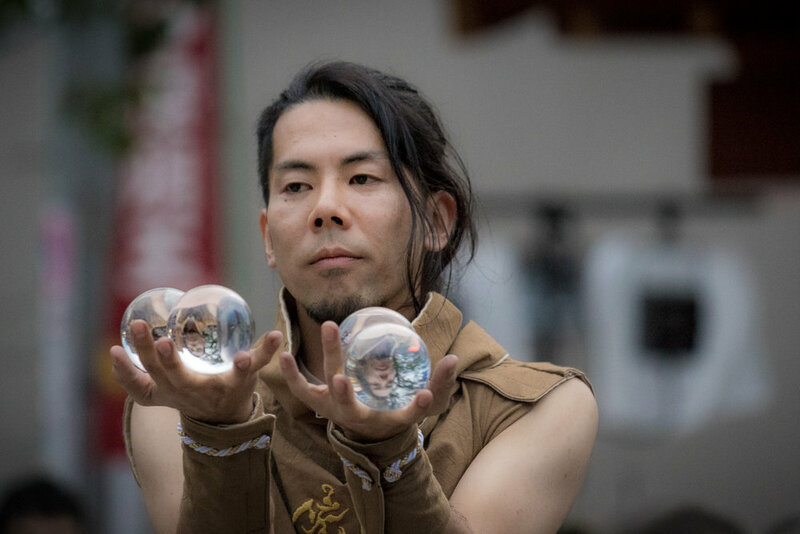 The first act was by the "contact juggler" who mesmerized with his glass balls. After that, it was time for the fire. As the evening grew darker, the contrast between the light from the fire and the darker background grew greater, and photographically it became more of a challenge. I had to underexpose by two or three stops to keep details in the highlights of the flames, which made the scene look a bit darker than it actually was, but I sort of liked the effect. The Fire Bandits act is very active, so I tried a few shots with a slower shutter speed to show the movement of the fire. Unfortunately, I didn't have a tripod, so I had to brace my elbows on my knees, and hold the camera as steady as possible. 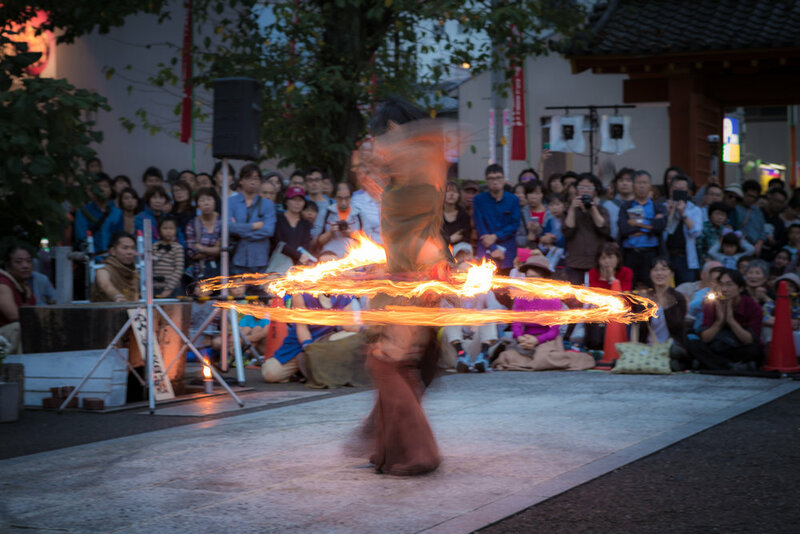 In the evening on Saturday, the festival wrapped up in front of the main plaza area again, with the Oiran Procession and Meriko performing in front of the big temple. The next day, Sunday, had acts all day as well, but it rained the whole day and I wanted to get home to cull the thousand or more images I'd already taken, and to edit the keepers, so I watched a few acts and left in the early afternoon. There were a couple acts which I quite enjoyed. One was Accordion Non Non　(アコル・デ・ノンノン). She is a tap-dancing accordion player whose positive energy is a joy to watch. She is a mother, and had her daughter next to her as she performed. My other favorite act on Sunday was the magician, Izuma (和風手品師 izuma). I had hoped to see her outdoor act, but because of the rain it had been moved indoors, under fluorescent lighting. The act was itself was captivating, beautiful and artistic, and of course the magic was excellent, and made great use of story and light. There were other notable acts as well, but in the interest of keeping this blog a manageable size, I'll stop here. 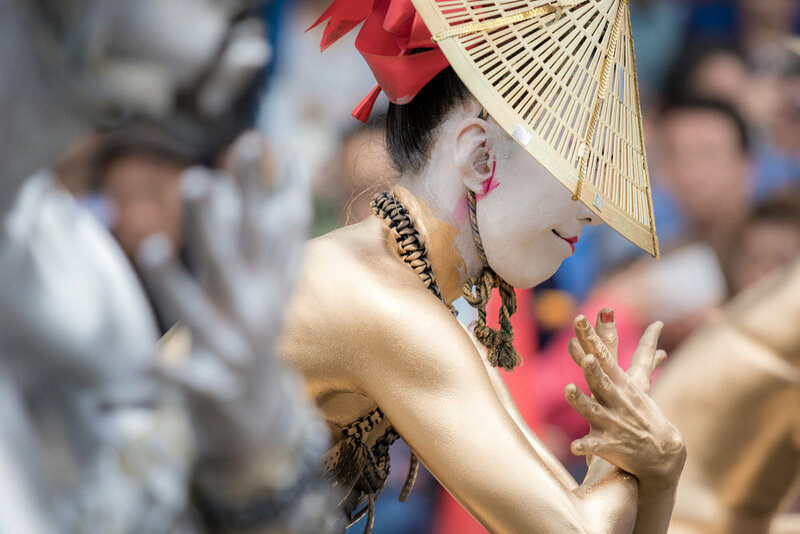 The Osu Kannon Street Performers Festival is probably my favorite festival in Japan, and despite the huge crowds and competition for prime photo taking spots, is great fun to photograph. 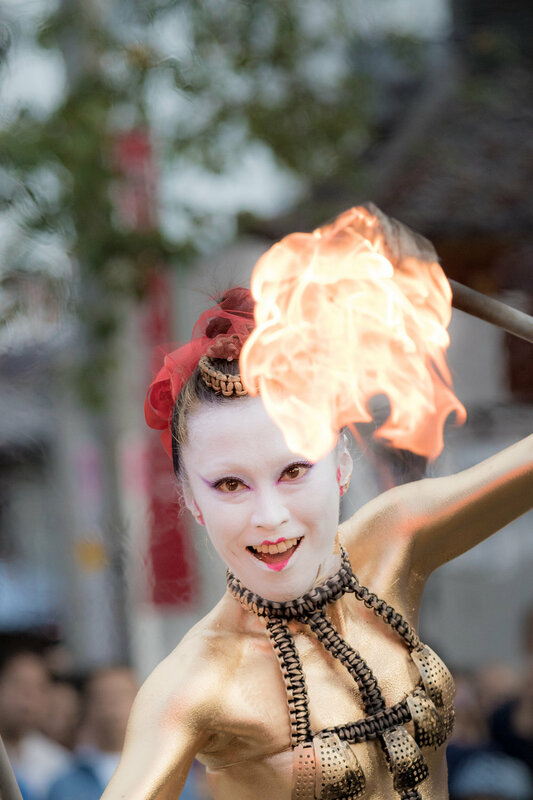 I think it must be difficult to make a living as a street performer, and I wish all the performers the best. It would be great if this blog could contribute even a little in helping them get the recognition they deserve.